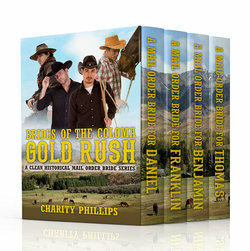 A Mail Order Bride For Daniel: Daniel Bishop is a handsome and kind miner of coal and gold. Though his work is thrilling and he has made a fortune in gold, there is one thing he is desperately missing: a wife with which to share both his life and riches. He has been writing letters to a sweet and feisty young woman named Hannah James, a jewelry store clerk in New York, and she is eager to join him out West. Problems arise when Hannah raises her desire to continue selling jewelry as she had back East. Daniel, out of concern for her safety, initially tries to discourage her due to the fact that the town is known for its history of run-ins with bandits. One day, while Daniel is away working, Hannah attempts to go mining on her own, and due to her lack of experience, she finds herself lost in a deep, dark cave. Will Daniel be able to save his new bride from danger, and if so, how can he ensure her safety while helping her fulfill her lifelong dreams? A Mail Order Bride For Franklin: Sheriff Franklin McQueen and his son, Geoffrey, work tirelessly to keep the town safe from bandits. A few years prior, Franklin’s beloved wife, Gladys, passed away; now, the sheriff longs for a new wife on which to bestow his love and care–and with which he can better run his jail house. After placing an advertisement in the newspaper for a mail order bride, he begins corresponding with a young woman named Miss Louise Winchester. When she arrives, however, she feels overwhelmed and out of her depth while helping in the jail house, and comes to believe that she may not be the right sort of woman for Franklin after all. When she finally begins to feel at ease, it turns out that one of the bandits has it in for her. Can Franklin keep his new bride safe from harm? A Mail Order Bride For Benjamin: Upon being released from jail on account of his good behavior, Benjamin Pickett is ready to start a new life and set up roots in the town of Coloma. The former bandit has begun to form a friendship with Franklin, the town sheriff, who warns him that although he is reformed in the eyes of the law, that the townsfolk may still be wary of him. With Franklin’s help, Benjamin acquires a job at the neighboring lumber mill, and after gaining the trust of his new boss and his fellow workers, he is given a chance to build the home of his dreams. He longs for a wife to share his life with and places an advertisement in the newspaper, and before long, he is sending a ticket for Miss Maybelle Fields to travel from Maryland to join him. Only one problem remains. How can he propose to Maybelle until he has confessed the truth about his past? A Mail Order Bride For Thomas: Thomas Cooke, the head supervisor at the lumber mill, watches his coworkers return home every day to their loving wives and begins to desperately long for a wife of his own. There aren’t many women living in town who aren’t already spoken for, however, so he decides to place an advertisement for a mail order bride. When a charming cook named Violet Pringle arrives, it seems as though they were made for each other, cut from the same piece of dough, as Violet likes to think. Just days after their wedding, while Thomas is away at the mill, a fire breaks out in town. To his dismay, he learns that the flames are in fact coming from his home. Will Violet, the love of his life, be spared? Will the flames devour the home he built with his very hands?